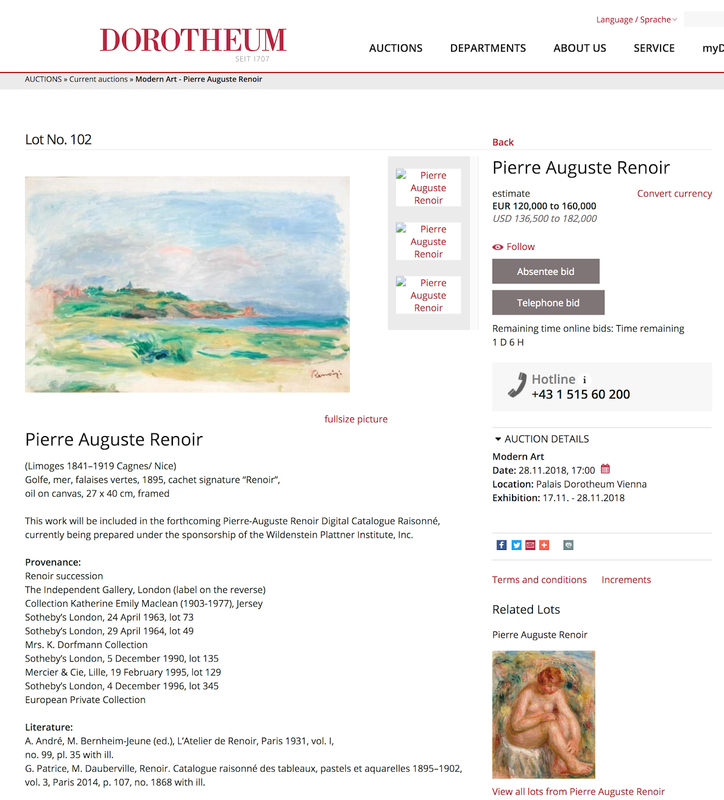 Art theft as a profitable career: An update on the Pierre-Auguste Renoir art theft in Vienna and its connection to a Ukraine art dealer. On November 28, 2018 three well-dressed men in jackets and coats entered Vienna's oldest auction house, the Dorotheum, just after sunset, and made off with a landscape painted by Pierre-Auguste Renoir titled Golfe, Mer, Falaises Vertes (English: Gulf, Sea, Green Cliffs, just ahead of the painting's autumn sale. Lot 102 in the "Modern Art" auction, the oil on canvas painting was executed by the French impressionist artist in 1895 and was estimated to sell at between €120,000 and €160,000 at the time of its Autumn consignment. The painting was also to be listed in the forthcoming Pierre-Auguste Renoir digital catalogue raisonné being prepared under the sponsorship of the Wildenstein Plattner Institute, one of two rivaling authenticating bodies believed to have the last word when it comes to Renoir. According to spokespersons with the regional court and police in Vienna, one of the three accomplices, a 59 year old Kharkov antiquarian named Vadim Guzhva, was arrested at Schipol Airport in Amsterdam on December 12, 2019 and then transferred to Vienna authorities to face charges in Austria on December 28, 2018. At the time the European arrest warrant (EAW) was executed, a shopping bag recovered in the defendant's Amsterdam hotel room was said to match the one which had been carried by another accomplice on the day of the theft in Austria. 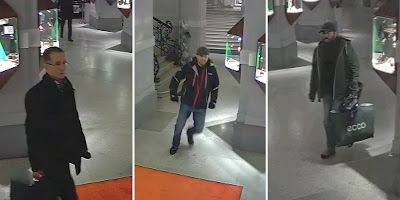 That bag appears in the CCTV footage taken at the Dorotheum of the three suspects on the day of the painting's theft. It is speculated that Guzhva may have been shopping the Renoir to individuals on his trip to the Netherlands or perhaps in a Scandinavian country as he had apparently purchased a ticket to Sweden. On January 23, 2006 Guzhva was stopped by authorities in the city of Pavlysh, Ukraine following up on investigative leads received by the Kyiv Special Service Police (UBOP). Inside his Opel-Astra, officers found a painting by the celebrated Russian-Armenian seascape artist, Ivan (Hovhannes) Konstantinovich Aivazovsky, titled "A Sea View." The artwork had been rolled up under one of the seats inside the automobile. Aivazovsky's artwork had been stolen from the Odessa Art Museum on the night of June 21, 2005. Fingerprints found on the rolled canvas where also matched with fingerprints found on the discarded frame of a painting by Vasily Polenov, titled "Resurrection Pechersk Monastery" which was also stolen, in a broad daylight theft on September 17, 2005 at the Sevastopol Art Museum. Russian news reports have stated that during the Sevastopol theft Guzhva first made several reconnaissance visits to the museum before actually moving forward with the theft of the painting in order to scope out the museum's vulnerabilities. On the day of the theft, under the guise of Russian art connoisseurs, one accomplice, thought to be Igor Filonenko, is believed to have distracted a guard with questions about another artist's painting in order to create a ruse which would buy sufficient time for a second accomplice to deftly substitute the artwork with a laminated photocopy of the canvas. Laundered via the black market, the Polenov landscape later reappeared after Guzhva's arrest. On October 6, 2006, an anonymous individual contacted the Russian Interior Ministry and reported that a plastic bag with artworks could be found near the building of the Department for Combating Organized Crime in Moscow. Inside said bag, officers recovered not only Vasily Polenov's "Resurrection Pechersk Monastery," but other artworks as well, including a vase made by Polish masters stolen from the Hermitage in 2005, a bronze statuette titled "Master of Evil Demons June Kui" and a piece of porcelain ware “Arbor for Cicadas” which were stolen in May 2005 from the Chinese exposition at the Kunstkamera Museum in St. Petersburg. 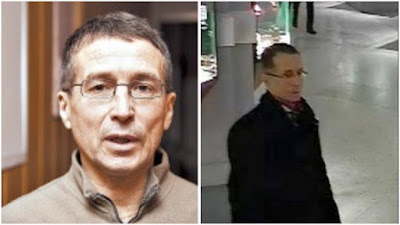 Yet despite testimonies and various alabis, as well as claiming he was framed by corrupt members of the Department for Organized Crime Control in Kirovograd, Guzhv was also implicated by Igor Filonenko, who testified against his former cohort from prison. Guzhv was subsequently convicted by the Malinovsky District Court of Odessa and went on to spend six years in an Odessa prison. According to Vienna State Criminal Police Office, the suspect's two alleged accomplices have not been arrested and the whereabouts of the 1895 Renoir landscape remains unknown. What is known is that frequently, without creating any sort of public scene, thieves are able to take advantage of undersecured & unprotected galleries, museums, and auction houses where cases like this show that culprits are able to quietly enter and nonchalantly remove artwork from a display and then calmly and discreetly leave the building before security even notices. While it seems that this could only happen in the movies, in real life, it happens more frequently than one would imagine. Aivazovsky's works are quite popular among art thieves and Russia and the Ukraine region specifically have had their share of thefts of this artist's works, only to have them reappear on the legitimate market long after their initial theft. In 2017 "View on Revel" (1845), stolen from the Dmitrov Kremlin Museum in 1976, was listed at auction with Koller Auktionen in Zürich, Switzerland with an estimated sale price of one million dollars. In June 2015 another of his paintings, "A Night in Cairo" valued at £1.5-2 million, was removed from an auction at Sotheby's pending clarification of circumstances after a request by the National Central Bureau of INTERPOL in Russia was made to Great Britain authorities as the Russians stated that they believed that the artwork was stolen from a private collection in Moscow in 1997. On January 13, 2011 a number of insured paintings, including another by Aivazovsky, were stolen from the country house of Aleksandr Tarantsev, the president of the Russian Gold Group. Tarantsev's name has since been linked with the Medvedkovo-Orekhovskaya group for the money laundering. Entering Vienna's oldest auction house, the Dorotheum, just after sunset, three well-dressed men in jackets and coats, working in tandem are believed to have made off with a landscape painted by Pierre-Auguste Renoir titled Golfe, Mer, Falaises Vertes (English: Gulf, Sea, Green Cliffs) just ahead of its Wednesday sale. 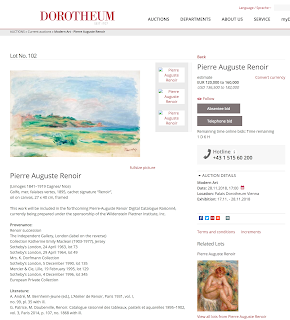 Lot 102 in the "Modern Art" auction, the oil on canvas painting was executed by the French impressionist artist in 1895 and was estimated to be worth between €120,000 and €160,000 at the time of its consignment. It was also to be listed in the forthcoming Pierre-Auguste Renoir Digital Catalogue Raisonné being prepared under the sponsorship of the Wildenstein Plattner Institute, one of two rivaling authenticating bodies believed to have the last word when it comes to Renoir. One of the world's oldest auction houses, established in 1707, the Dorotheum has not yet issued a statement on the theft, but law enforcement authorities in Vienna have released CCTV stills of the three people wanted for questioning. Editor-in-Chief Noah Charney features "Q&A with Joris Kila and Karl von Habsburg" in the Spring/Summer 2012 issue of The Journal of Art Crime. Kila and Habsburg are co-winners of the 2012 ARCA Award for Art Protection and Security. For more information about them, please see the article on ARCA Award winners in this issue. Joris Kila answered questions on behalf of both parties. Joris Kila is chairman of the International Military Cultural Resources Work Group. He is a researcher at the Institute of Culture and History of the University of Amsterdam, and a board member for civil-military relations with the World Association for the Protection of Tangible and Intangible Cultural Heritage in Times of Armed Conflict (WATCH), based in Rome. Additionally, he is a former community fellow of the Cultural Policy Center at the University of Chicago. He is a member of the US Commands Cultural Historical Action Group and Chair of the International Cultural Resources Working Group. Until recently he served as network manager and acting chairman of the cultural affairs dept. at the Civil-Military Co-operation (CIMIC) Group North in the Netherlands. In that capacity he undertook several cultural rescue missions in Iraq and FYROM (Macedonia). Noah Charney: Tell me about the Austrian Society for the Protection of Cultural Heritage and Blue Shield Austria. How did these initiatives begin and what are some of their current projects? Joris Kila: The current Austrian situation concerning the implementation of the 1954 Hague Convention (1954 HC) for the Protection of Cultural Property in the Event of Armed Conflict, especially within the Austrian Armed Forces (AAF), is not the product of well-organized activity; it is rather the result of a number of individuals’ efforts while working in a variety of positions at the right time. A long time passed between Austria’s 1964 ratification of the 1954 Hague Convention, and its implementation and dissemination within the AAF. The first Austrian “military mission” in which cultural property protection (CPP) played a role, occurred in 1968 in the context of the “Prague Spring.” The Austrian government and military leaders expected Soviet troops to cross Austrian territory on their way to Prague, violating the country’s sovereignty and neutrality. Knowing that the Soviet troops could not be stopped by military force, Austria prepared for an invasion. By initiative of the Federal Bureau for Monuments and Sites (FBMS) and under the supervision of its provincial departments, hundreds of Blue Shields, the emblem of the 1954 HC, were distributed in districts of eastern and northern Austria and, through the active participation of gendarmerie and army officers, these were attached to historical or cultural monuments along the anticipated Soviet route through Austria. It was greatly feared that Soviet troops would not respect Austria’s rich cultural heritage, which had already suffered badly during World War II. The idea was that this time the enemy would at least be made aware of the fact that with every destructive step they took, they were likely to be violating international law. This form of resistance without force at the climax of the Cold War initiated the birth of some sort of “Blue Shield Movement” in Austria, which finally resulted in the foundation of the Austrian Society for the Protection of Cultural Property in 1980. This civil organization is still characterized by having many regular and militia army officers among its members who are entrusted with most of the positions on its steering board. The Society also played an initial and decisive role in setting up the Austrian National Committee of the Blue Shield in 2008. Therefore, both organizations – forming an interface between civil and military expertise as well as providing an unrivaled pool of experts within Austria – consequently have an interest and high competence in (today's) military CPP. You may read the rest of this interview in The Journal of Art Crime by subscribing through ARCA's website.